回家翻了一下這個攻擊方式, 這個案例很有趣, 有人說是 Man On The Side Attack . 我好奇了一下, 有什麼 IC Design House 的黑科技可以做到這樣的技術, 關於這篇文章提到的訊息太少, 所以又找了其他二篇文章. 經過分析, 問題出在 Client 傳出 GET HTTP/1.1 之後, 馬上就會回傳一個帶有其他網址的封包, 而這個封包是帶有 FIN Flag. 個人看法統統都不是, 因為我連的 IP 仍然是 taiwan.cnet.com 和 tw.msn.com 的 IP. 而有問題的封包是搶在 SERVER 回應之前送來的. 3. IDC 被 ARP Spoofing, 流量被導到某些被破台的機器. 尤其是 hinet 的用戶. cnet.com 和 msn.com 暫時就不要去了, 到 Google 多好, 沒事. 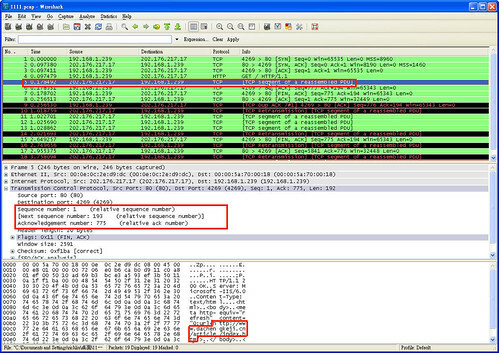 這邊補充一下使用的工具是 Wireshark, 這是一套跨平台功能強大的 Packet Logger. 配合發展的 libpcap 也是一個強大的 Packet capture library. 大家都知道 snakeoil.dom 是 apache 內預設的憑證. 最近這一台機器放的地方被 arp 攻擊. 所以三不五時就會斷線, 然後等待 route arptable time out. 2. drop collection, 就是發一個 arp request , 會有不止一個 arp reply . 3. heal network . 可以恢復其他電腦被污染的 arp cache. 我主要還是用 1. trust ip/arp 這個功能. 再加上 ping . 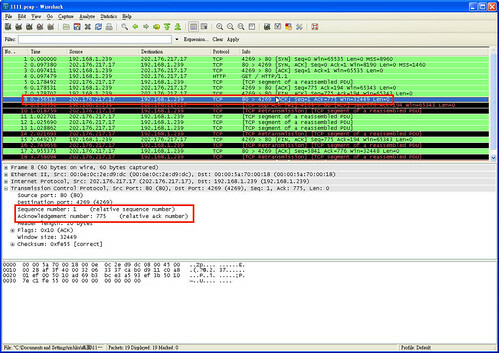 如果要找兇手, 就要掛上 management switch 查 mac address/port 了. 大概是在 c7b 喝了 Coffee 太興奮了, 除了睡不著, 還處在亢奮狀態, 就來寫寫 Blog 吧. 同事一直在 complain 他朋友的電腦一直中毒. 聊了一半, 其實發現很多人裝了 Anti-Virus and Personal-Firewall 根本沒有用. 2. 在 Mail Server 上裝 Anti-Virus . Anti-Virus 不用多, 一套就好, 夠用就好. 3. 絕不執行任何的 .exe , 不管是好朋友, 男朋友女朋友炮友, 只要是 .exe 都不執行. 5. 在 Home Gateway/Home Route 後面安裝完 Windows 再放到網路上. 如果你直接接到網路上, 還沒有 update 完 Windows , 就中毒了. 6. 小心使用外掛和 Keygen , 必要時請在 VMWARE 開一個 Windows 算. 現在: …. 大多數時間在 Linux 下, Virus 也很難找上我吧….. 而且只有留一個 ssh 連到 notebook 內的 Linux ………. 保持最新就沒有問題囉. 查了一下，日盛是用 Microsoft 的 IIS5 . 更新, 華駿國際原先開發SafetyWeb的台灣 RD 工程師己經全部離職, 聽說目前是在大陸開發. 有一隻 Worm 透過 Google Search 有漏洞的 phpBB , 再從這個管道散播出去….